With commentary of Solomon ben Joseph Serillo (d. 1558) and several halakhic writings, 17th century copy. f. 1r-130v: Treatises Berakhot and Pe’ah in band 1 (beginning and end missing). f. 1r-2r: Responsum on ritual slaughtering by Jacob Ibn Habib. f. 2r-5r: The same by Joseph Fassi. f. 5r-7r: Rules for Ritual slaughtering by Samuel ben Joseph Serillo. f. 7r-8v: Several rules for ritual slaughtering. f. 8v: Halakhic rule by Zekhariah Halevi. f. 9: Rules for ritual slaughtering by Don Judah Benveniste. 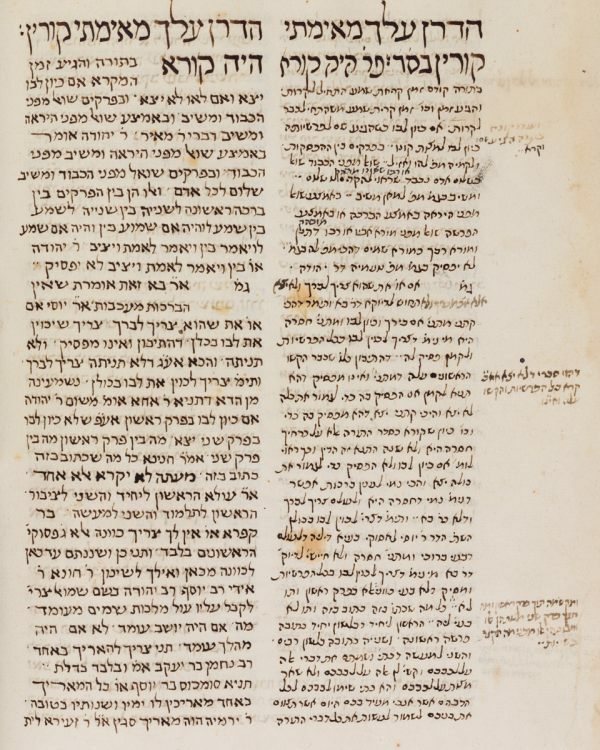 f. 11r-51v: several halakhic responsa. The treatise Berakot with this commentary was published by M. Lebmann in Mainz, 1875. Hebrew and Aramaic / 19,4 x 20,8 cm. /  ff. (foliation starts with f. 58 and ends with f. 161) + 54 ff. / Two different Sephardic cursive hands, Jerusalem Talmud in square unvocalised writing, commentary in cursive; some annotations in outer margins in hand 1 / No title / Table of contents in hand 2 on front flyleaf.